After watching and reading a few reviews on this combo I was eager to give them a try and see if all the hype was right. I have been using these two together in the morning for around two weeks and I have made up my own mind on these now. 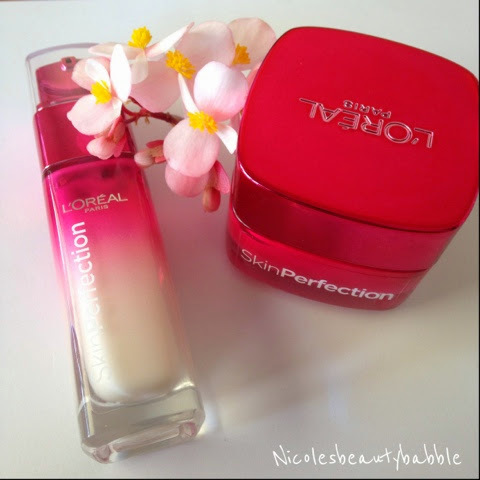 The Skin Perfection Concentrated Correcting Serum - This serum is stated to be "The first Concentrated Correcting Serum which visibly improves the quality of skin texture, tone and appearance of pores." I have to say that I have not noticed any difference with my pores over the two weeks, it does however make my skin feel hydrated and my skin texture has improved and become more supple and fresh looking. The Skin Perfection Correcting Day Moisturiser - Again this moisturiser is stated to be "The 1st correcting moisturiser that visibly improves the quality of skin. I have noticed the same results as I have listed above in my two week usage, My skin texture has improved and feels soft, hydrated and fresh. This moisturiser is also suppose to reduce the size of pores but unfortunately for me I have not noticed this at all. Over all I agree with some of the statements for this skincare range but not all. I have been loving these two together as mentioned it has made my skin feel and look a lot better and specially coming out of winter it did need a bit of TLC. If you are looking for a good combo to hydrate your skin and restore that fresh clean feeling then I would recommend these. I purchased mine from Priceline here. Have you tried this line or looking to try it? Nice little review. Ive been using this product for quite a while now and i have to say the serum i can tell a difference. I havent been using the serum lately as i need to purchase a new one. I have to say i can tell a difference with my skin now that im not using it. It helps with my pores and ill be investing in this again. Cant really say much for the moisturiser, maybe ill stop using it to see if i can tell a difference. I love your style of blogging :) Never been a fan of blushes, never seem to be able to apply they correctly, i suppose its just practice practice pracitce. Thank you for your comment Hun, Maybe I need to continue to use it for a bit longer to notice the difference in my pores.